Birth of Joseph A Land, Sr.
Joseph, born January 22, 1896, the son of Law Land, carpenter, age 38, born in England, and Elizabeth Sykes, age 39, born in England, the eighth of eighth living children, address 14th Street, Hoboken. I can't read the house number because the ink is faded. (New Jersey Birth Registration). "Smithtown Branch - L. I. April 12 - A baseball team that is already in good form and one of which will make many older teams "sit up and take notice" in 1916 team of the Smithtown Branch High school. The players in the picture are: Top Row - Dr. Frederick C Petersen, Professor M. C. Fisher, principal of the school, and Axel Pohja. Middle row - Ellis Seaman, captian, Bernard Olivie, Fred Strum, Joseph Land, Ross Sanford, and Gustaye Kontack. 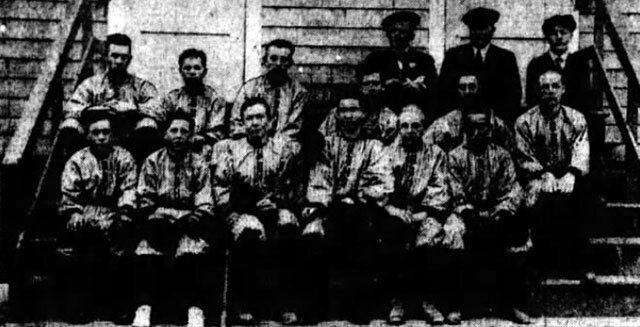 Bottom Row - Arthur Edgar, Edwin Curry, Ralph Hudson, James Nichols. Joseph Land married Mary Elizabeth Lorah. (Information from Michael Tyrkala) They were married before New Years 1921 as indicated in a news article about them visiting Hauppauge. Mrs. Law Land. Mrs. Law Land visited her son, jJseph Land, and wife in New York City in April 1922. Sonestown is north west of Allentown. According to some information posted on GenForum. Jacob Lorah fought in the Civil War. He married Anna Louise Mendenhall Trappe in Muncy Meeting. They had three daughters. One died as a child. The others were: Mary Elizabeth and Anna Gertrude. "About the same time William and Jacob Lorah and Thomas Dent engaged in lumbering, farming and mercantile business in the place. In 1869 the Sones property was purchased by Messrs. Lorah and Dent. Jacob Lorah engaged in the mercantile business. A few years later Robert Whitacre erected a store and dwelling house and engaged in the same occupation." "Anna Louisa Mendenhall m. Walter B. Trapp, who died August 9, 1876, son of Thomas and Mary Jane Trapp. Two children: I. Mary, deceased. II. Walter C. After the death of Walter, Anna m. Jacob Lorah; dwells at Bloomsburg, Pa., and has III. Mary. IV. Gertrude." 2 June 1898 Sonestown funeral of Jacob Lorah. Mary Elizabeth Lorah was with the American Red Cross in 1918. Her passport application indicated that she was born 10 November 1888 to Jacob Lohah, who was deceased by 1918. She was listed as a teacher. Age 29, 5 feet 3 and a half inches, blue eyes and dark brown hair. Her application included a certification from the American Red Cross and a confirmation from the War Department. There was also a request for the passport to include Italy and England as well as France. She returned stateside on 14 July 1919 from Brest to New York. Joseph A. Land also served in the American Red Cross in France. I would assume that they met in Europe. 1920 Census: Lansdowne, Delaware, Pennsylvania Adalade M Graham	42, store keeper, Anna M Lorah	69, servant, widow, house keeper, Gertrude Lorah	26, boarder, clerk store, Louise B Crow, boarder, 52, bookkeeper. Mrs. Lorah died February 1929 in Philadelphia. Pennsdale, Feb 14 - The funeral of Mrs. Anna Mendenhall Lorah was held on Saturday afternoon in the Friends Meeting House at Pennsdale.....Mrs. Lohan was the daughter of William S and Mary S. Mendenhall.....she was survived by three children. W. -------, Miss Gertrude Lorah of Philadelphia, and Mrs. Joseph Land of Smithtown, Long Island and by two brothers, John W. Mendenhall of Muncy, and George Mendenhall who lives in the west . Interred at Friends Cemetery." 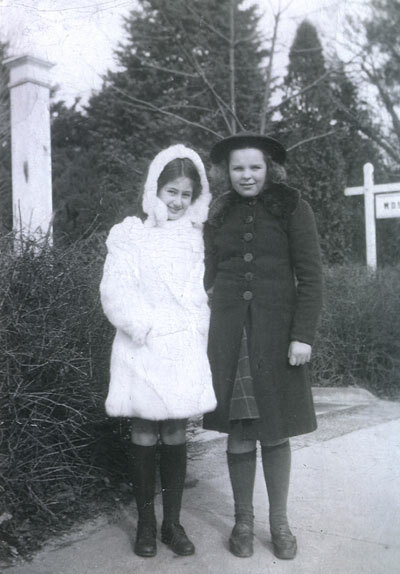 In 1934 Joseph and Mary Land visited her sister, Mrs. Gertrude Hess, in Philadelphia. 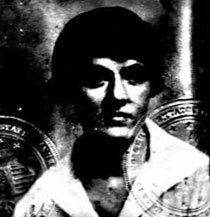 Passport photo of Mary Lorah. Mary Ann E. Faircloth, 1945-1946 buried Hauppauge Cemetery in the Land plot. College: Freshman at Alfred University, September 1942. Joseph Land '46 of Klan was initiated Sunday Afternoon, The Fiat Lux, Student Paler of Alfred University, Alfred N. Y. Civil Occupation: Student Codes 0x, 2x, 4x and 6x as pertain to students will be converted, for machine records purposes, to the code number 992. POW: This record indicates that Joseph was captured December 20, 1944. Family history says that Joe was captured at the Battle of the Bulge. Joseph A Land captured at the Battle of the Bulge (December 1944-January 1945) was originally taken to Stalag IX-B near Frankfurt. Joe Land was among 350 American GIs transferred to Berga Work Camp in February 1945 where they were treated as slave labor. Berga had one of the highest death rates of any Prisoner of War camp in Europe. Joseph Land was one of the 73 prisoners who died as a result of overwork and starvation. Just as the war was ending the Germans marched the Berga prisoners south. On the way many prisoners died. They arrived in Zedtwitz about 50 miles south of Berga on May 8, 1945. Sometime in the following five days Joe Land was one of 11 GIs who died. The war ended in Europe May 9, 1945. 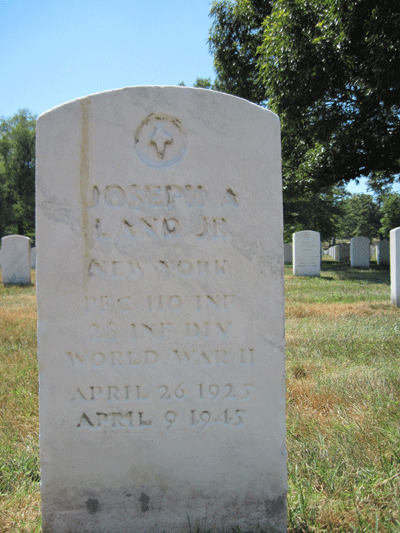 Joseph A Land Jr PFC service #32971677 was buried in Arlington National Cemetery, Fort Myer, Virginia, grave #7636. 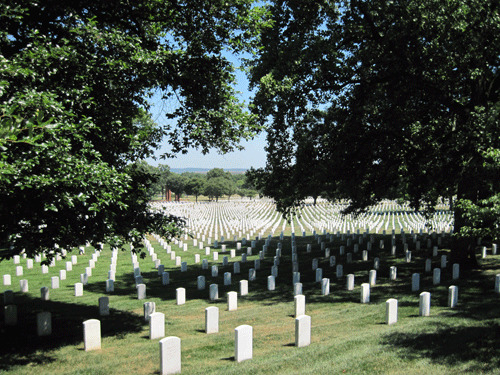 His grave is located in Section 12, grave #7636, date of death 04/09/1945*, date of burial in Arlington 02/04/1949. Location of grave: From Jefferson Highway on Memorial Drive to Eisenhower Drive (Left) on Eisenhower Drive to McClellan Drive. Right on McCellena - past McCellan gate (arch) - Left at grave marker #7611 to grave #7636. *Germany surrendered to the Allies on May 9, 1945. My father-in-law, John Blanck, was also a POW of the Germans in WWII. For information and images of his POW experience go to John Blanck, Military Service now or at the bottom of the page. Birth: Margaret Carleton Land 30 May 1932. Marriage: Margaret married John Edward Tyrkala. Children: They had 2 sons and 2 daughters. (Information from Michael Tyrkala, April 2004) Carol, Mary, John E Jr. and Michael (per obit). The Tyrkalas lived in Sebring, Fla.
Joseph A. Land born Hoboken, New Jersey 2 January 1897 to Law Land born England living Hauppauge Long Island immigrated from Liverpool about 1884 and has been in the US for 34 years, naturalized citizen, court unknown January 1902. Joseph stated his occupation as bookkeeper. He had never been abroad before. Desired a passport to go to France to do Red Cross work. Intending to leave US from New York about March 1918. Stamped March 26, 1918. He was discribed as 21 years old 5 feet 9 inches, blue eyes, brown hair. P. F Weidenkeller, mechanic, 420 West 129th street, New York, was a witness. His application was accompanied by a letter of support from the American Red Cross. It included request that he be apporved for travel in France and England. An affidavit was also submitted by Ruth Wiedenkeller confirming his date and place of birth. 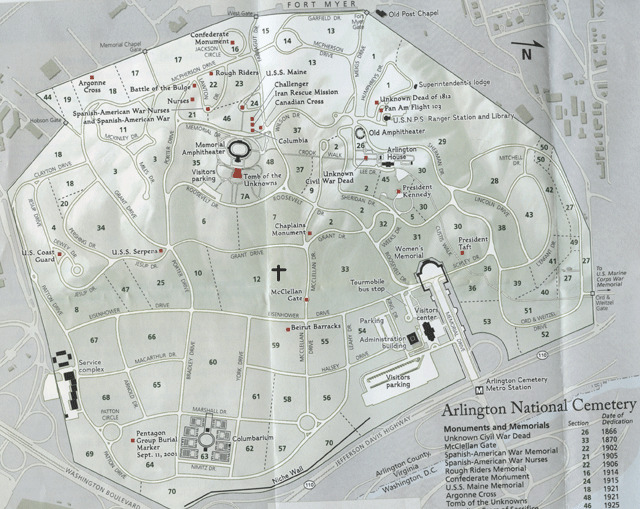 There was also a Red Cross document that indicated he would travel via England. 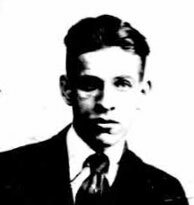 Passport photo of Joseph Land. Cunard Carmania, 12 April 1918, Liverpool to New York, Land, Joseph A. age 21, Amer. Red X, born U. S.A.
A reception was held Tuesday evening at the home of Mr. and Mrs. Law Land for their son, Sergeant Joseph Land, who this week returned from a year's service as an American Red Cross driver in France. Norman Land and Harry Nichols, both recently discharged from the U. S. N. R. F. were also present besides fifty guests. Refreshments were served under the direction of the ladies of the M. E. Church. According to articles in the Long Islander he was living in New York City in 1920 to 1922. I did not find them in the 1920 census. Mr and Mrs. Joseph Land and small daughter were living in Brooklyn. In 1923 they were listed as being from Richmond Hill (which is in Queens). The Long Islander said Mr. and Mrs. Joseph Land and daughter were living in "Percy Land's tenement house for the summer" Hauppauge of 1924. Another articles indicates that their normal address during 1923 and 1924 was in Brooklyn. The Brooklyn Daily Eagle reported on Santa Clauses's visit to Smithtown. At the showroom of Nichols and Land each child received a box of candy and an orange and a chance to see a real live reindeer from Icy Cape, Alaska. Music was furnished by the American Legion Drum and Bugle Corps. Joseph A. Land was secretary of the Board pf Trade committee which had organized the event. The family of Joseph Land moved to Smithtown from Stoney Brook. Mrs. Joseph Land and children were visiting her mother, Mrs. Lorah, in Philadelphia. The Joseph Land family lived on Mayflower Ave. Smithtown Branch. Joseph A Land was on the Republican ticket for receiver of taxes for Smithtown Branch. Joseph Land was the leader of Boy Scout Troop 3, Smithtown. The Smithtown Board had authorized Receiver of Taxes Joseph A. Land to employ counsel to defend him in a mandamus action which has been instituted in the Suffolk County Supreme Court by N. M. Lord, of Riverhead, to force the receiver to refund to him the mailing fee of 25 cents each charged against tax bills which Lord paid for property owners who live out of town. Lord, it appears, makes a business of paying tax bills for people living out of town. The law requires the receiver to collect a mailing fee of 25 cents each on all tax bills sent to out of town people. These fees go to the town, not the receiver. Lord has taken the stand that he should not be olbidged to pay these fees, and Mr. Land takes the stand that no exception should be made in his case, a stand which the receiver is supported by the town board. The amount of money is said to be not large, and the board members agreed that it probably will cost more to defend the suit, but that a defense must be made. The family camped at Long Beach in June 1931. In November 1931 the Democrat Frank Kickols defeated Joseph Land for tax collector by a vote of 1,5030 to 1,437. A judgement against Joseph A. Land by Alfred L Hart $211.25, November 1932. In November 1934 Joseph A. Land was listed in the Long-Islander as the Smithtown receiver of taxes. Joseph A Land of Smithtown was arrested in December 1934 on charges that he appropriated $3,000 in tax fees he collected as Receiver of Taxes for the town of Smithtown. The charge was first degree grand larceny. He had been elected for a two year term in November 1933. He pleaded "not guilty". Bail was set at $1,000. In December 1934 the Smithtown board appointed former tax receiver, Frank T. Nichols, a Democrate, to fill out the unexpired term of Joseph A. Land who "failed to qualify by not filling his bond within the stipulated time." Long-Islander as the Smithtown receiver of taxes. "Land failed to turn over to the Supervisor the sum of $3,072.16 in tax fees and penalties which he is siad to have collected. This money is ordinarily turned over the first of June"
I can't find anything further on this. A judgement against Joseph A. Land by by Sun Indemnity Co. $903.65, October 1935. Pfc. Joseph Land was reported missing in action on December 20, 1944 on the Western Front according to a War Department telegram received by his parents. Joesph , age 19, joined up in July of 1943 and was shipped overseas in October of 1944. He was serving with General Patton's 3rd Army in Luxembourg. "He was a member of a relatively untried outfit which gave a heroic account of itself against overwhelming enemy forces when the Germans started their sudden push early in December." He was a graduate of Smithtown High School class of 1942 and had completed his first year of Alfred University when he enlisted. His parents were the proprietors of the Traffic Coffee shop in smithtown Branch. They were hoping for good news from the Red Cross concerning the whereabouts of Joseph. Pfc. Joseph A. Land, the only son of Mr. and Mrs. Joseph A. Land, of Smithtown Branch, died in a German prison camp shortly before peace with that country was declared his parents have been officially informed. According to the Army officials the young man literally starved to death. March 6, 1946: Mr. and Mrs. Joseph Land, daughter, Margaret, and Mrs. and Mrs. Obadiah Faircloth left on Tuesday for New Hampshire where they planned to live. They were the former owners of the Traffic Coffee Shop. Margaret Land Tyrkala of New Hampshire was issued a licence as a registered nurse in November 1953. Family history says the entire Joseph Land family moved to Florida. Services for Mrs. Mary L. Land, 69, of 122000 NE 12th Ct. will be at 11 a.m. tomorrow in the Church of the Resurrection under direction of the Philbrick Miami Shores Chapel. Mrs. Land, who died yesterday is survived by her husband, Joseph A; two daughters Mrs. Margaret Tyrkala and Mrs. Elizabeth Faircloth all of Miami; four grandchildren and a sister. Mrs. Ida Baade, formerly of the Landing, Smithtown and Joseph Land formerly of Maple ave, Smithtown married in Miami Florida on Mary 1. Ida was the widow fo former Smithtown policeman George Baade. Joseph had been the proprietor of the Traffic Coffe Shop on Main street. A reception was held at the home of Mrs. Land's daughter, Mrs. Elwood Jones. The Lands were residing in North Miami. Mr. and Mrs. Joseph Land of Miami Florida spend a week visiting friends and relatives in Smithtown. Joseph Land of Miami, Fla. died in a hospital in Miami following a heart attack. Before moving to Florida he had owned a hotel in Lyme N. H. Before that he had lived for many years on Mayflower ave in Smithtown, N. Y. He and his first wife, Mary, had owned the Traffic Coffee Shop on Main st., Smithtown where the Neber's Surf Restaurant stood in 1962. A son Joseph had died in WWII. He was survived by his second wife, Ida Baade Land, two daughters, Mrs. O. H. Faircloth (Elizabeth) and Mrs. John Tyrkala (Margaret) seven grandchildren, a brother, Norman of Smithtown, two sisters, Mrs. Harry (E. Courier) Distler of Massapequa, and Mrs. Edna Wiedenkeller of California. Buried Masonic Cemetery in Miami. On April 7, 2002, Michael Tyrkala, a grandson of Joseph Land, emailed the following information. "Joseph Land Sr's wife, Mary Elizabeth Lorah is from the Mendenhall family who today has a family association, mendenahall.org . Many people were doing the same research and combined resources. I have been working with them and got one branch of the tree back to the 16th century." Joseph married Mary Sarah who was buried in Miami Florida. Joseph died and was buried in 1962 in Miami Florida. Joseph's daughter, Margaret married, had lots of kids and lived in Florida. "Uncle Joe had polio as a child not a leg injury causing him to limp". Joseph joined the Army in WWI, drove an ambulance in Germany and was badly wounded in the leg, which caused him to limb for the rest of his live. Joe, Jr. was captured in the battle of the Bulge, suffered in POW camps, and died of malnutrition in Germany at a time when his parents owned a restaurant in Smithtown. Joe, Sr. had many businesses, real estate, wholesale candy, and once was receiver of taxes in Smithtown. After WWII Joe and Mary ran a hotel in Lyme, New Hampshire near Dartmouth College. Both Elizabeth and Margaret married and bought farms in Vermont. Joe served as a medic in WWI. Joseph, Jr. the only son of Joseph and Mary was killed in WWII. David Weidenkeller remembers he starved to death in a POW camp. Ted Weidenkeller remembers he was killed at the Battle of the Bulge. Both remember that Mary was never the same. Her health failed from despair. In later years the whole family moved to Florida. 1931: The Traffic Coffee Shop "an attractive lunch room" was opened by Stanley Boweres in 1931. The Boweres were still running it in 1932. 1938: The Traffic Coffe Shop - Famous for a Good Cup of Coffee - Sandwiches - Luches - Dinners Main Street, Smithtown Branch, Route 25 & 25 A - Mary L Land, owner, Joseph A Land Mgr. 1946: In 1946 the Traffic Coffe shop was on the north side of Main street near the Smithtown Sweet Shop. Joseph and Mary Land moved to New Hampshire in 1946. 1948: Ad for a waitress for the Traffic Coffee Shop, Smithtown Branch. 1950: Herbert Walz ran the Traffic Coffee shop when he introduced Chow Mein to the menu. 1952: In 1952 Bill bishop opened a stationary store just east of the Traffic Coffee Shop on Main street, Smithtown. 1957: The former Traffic Coffee Shop was reopened as Vincent Italian Restaurant. 1963: Mrs. Herbert Walz, age 66, whose husband had run the Traffic Coffe Shop for a number of years died in July 1963. 39. Grant's Hotel, (14 Market Street), c. 1809, Contributing building. Known over the years as Grant's Hotel and Alden's Tavern, the Lyme Inn is a 3-1/2 story frame and clapboarded structure located between Dorchester Road and Market Street facing the Common to the west. Measuring five bays wide and four bays deep, the structure is set above a stone block foundation and capped by an asphalt gable roof punctuated by four tall interior corbel cap brick chimneys, A single-story flat roofed enclosed porch with continuous windows spans the facade. "Colonial Revival" in style, it is sheathed in wide clapboards with double glass doors surrounded by sidelights, transoms and capped by a rectangular keystone. Sheltered by the porch, the original entrance survives within, containing a seven-panel wooden door flanked by half sidelights with an outer surround of pilasters decorated by a meander motif. Centered on the central bay of the front facade is a central deeply pitched pediment supported by four large posts enclosing a steel fire escape. Underneath the porch on the second floor is an additional doorway flanked by transoms and pilasters displaying a meander motif like that seen on the front door. Windows on the building contain doublehung 6/6 sash with simple surrounds, blinds and exterior storm windows. At the corners of the building, double corner pilasters span between a plain wide water table and the two-part frieze which surrounds the building beneath projecting eaves. Extending behind tho building is a two-story ell set above a mortared rubble foundation. Small 6/6 windows are located on the second floor above 8/8 windows. A single-story addition spans much of the south side with a deck/loading dock extending from the east side. Constructed by Salmon Washburn in 1809, who also drew the plans for the Congregational Church. Erastus Grant enlarged the hotel and operated it as Grants Hotel from about 1822 to 1870. The building was a center of community activity, the site of dances in the 19th century as well as the location of Grange meetings from 1875 to 1877 and again from 1886 to 1889. It was used as an apartment building rather than an inn for a number of years until 1918. (45) The porches were added in 1923. (46) The porte cochere, of pressure treated lumber, was added in 1987. Section 12 - McClellan Gate in distance. Photos of Friends and Relitves of Percy and Meta Land which includes photos of Libby and Margaret the daughters of Joseph Land.